SvrWxChaser #BREAKING: USGS Confirms a 5.2 #earthquake struck near Oklahoma City, OK. MORE INFO: on.doi.gov/sXNWn3 Lasted 90 seconds in Tulsa. TPierce (via email) Was setting at my computer at 10:54 when the desk started to shake and the monitor began to “walk” of the edge. My first thought was a plane low enough to cause that much vibration,and I was expecting the house to be hit. Not until after did I realiize what had happened. It is a terrifying expreience when the you dont know what it is. Here is the report of recent seismic activity in the Oklahoma area via https://sslearthquake.usgs.gov/ens/; you can sign up on the website to receive customized reports of interest to you in your area. Here are the earthquakes in the Map Centered at 37°N, 95°W area, most recent at the top. 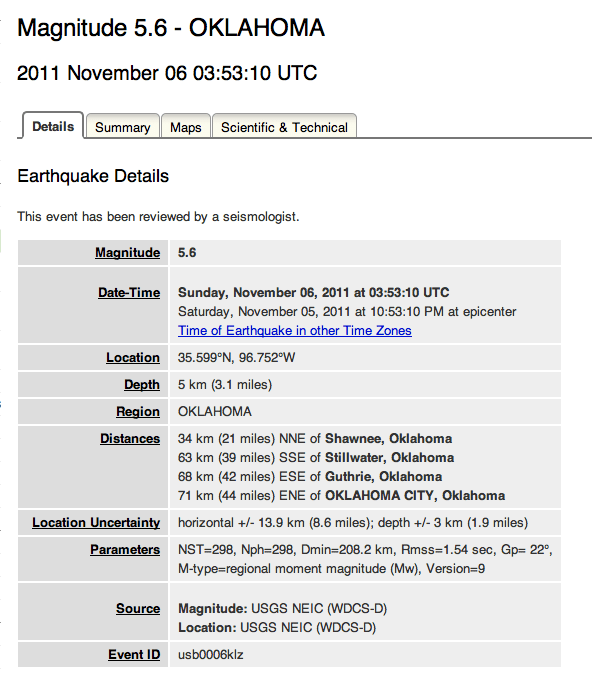 Click on the underlined portion of an earthquake record in the list below for more information. Previous Post: Is President Obama Smarter Than A Fifth Grader?